South Africa’s new vehicle industry had a less-than-ideal start to the year, with an 8.9% year-on-year decline in new vehicle sales. 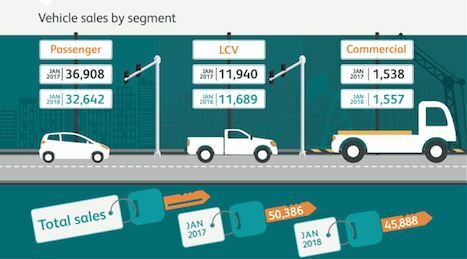 A total of 45 888 new vehicles were sold in January 2018, compared with 50 386 units in the same period last year. However, this decline in sales attributed almost entirely to a large, 33.5% drop in sales in the rental market. Although the overall market declined, positive consumer sentiment saw an increase in sales through the dealer channel. Dealer sales grew 1.8%, with year-on-year sales for passenger cars and light commercial vehicles (LCVs) growing 1.1% and 2.3%, respectively. This trend was also reflected in WesBank’s internal data. Consumer demand – as measured through the volume of finance applications received – grew 9%, year-on-year, for new vehicles. Similarly, demand for used vehicles grew 5%.